A sound follower, also referred to as separate magnetic, sepmag, magnetic film recorder, or mag dubber, is a device for the recording and playback of film sound that is recorded on magnetic film. This device is locked or synchronized with the motion picture film containing the picture. A sound follower operates like an analog reel-to-reel audio tape recording, but using film, not magnetic tape. The unit can be switched from manual control to sync control, where it will follow the film with picture. Many motion picture cameras do not record audio sound on the film, so in professional film production, there is a need to have the sound recorded and played back on a device that has a double-system recording to tapes, either DAT or Nagra, and then transferred to 16mm or 35mm separate magnetic film. The sound recording would then be synchronized with a movie projector or a telecine. Either 35mm film or 16mm film that is fully coated with a magnetic material can be locked, sprocket hole by sprocket hole, to the film with the picture image. On the set, a clapperboard is used to mark the spot where the sound and picture will later be synced. Typical sound followers lock by using 240 Hz bi-phase interlocking pulse signals to sync sound to film. The 240 Hz bi-phase is ten times the 24-frame rate. Sound followers are found in many post-production studios for record and playback and in movie theater for sound playback. In telecine use, the 24 frames per second is slowed to 23.976 frames/s to lock to SDTV and some HDTV standards, thus the digital bi-phase pulse is 239.76 Hz. The average feature film requires a large amount of 35mm film. One second of 35mm film uses 1.5 feet of film, moving at 18 inches per second (46 cm/s). One minute of film uses 90 feet (27.4 m), and one hour uses 5,400 feet (1.6 km). So, a two-hour movie with previews uses 11,250 feet or 2.13 miles (3.43 km) of film. For 16mm film, these numbers are all divided by 4. Because a two-hour movie is so long, the whole is divided onto five or six reels. While a film projector uses an intermittent mechanism to play the film, a sound follower and most telecines use continuous motion. By having the sound and picture sync this way this would save the expense and time of making an optical print or magnetic sound track strip on the edge of the film. The Sepmag would follow a projector or a telecine or a hand-cranked or motorized film viewer on a workbench. The sepmag sound follower would stay in sync with the film. In post production work, a dubbed sound track of sound effects, or a second language, could be added to other channels of the sepmag. Sepmag had different record head configurations. A device could have a single mono track, dual two track or 4 track. The tracks are very large and the magnetic film moving at the normal speed of 24 frames per second, gave very good sound reproduction. As such, a mixing studio would have many units, to mix all the sound and effect down to 4, 2 and one track as needed. Magnetic film used is 3 to 5 mils thick, the same as the picture film, so the picture and sound have equal diameters on the film reels. The magnetic film has magnetic oxide coating on the complete width of the film. The first films use were acetate base till 1970, the next base was polyester base. Acetate base can have degradation, the ferric oxide coating and the Acetate base can cause vinegar degradation. In 1914, the first SEPMAG patent was filed. In 1929, the first sound follower was on the market and by 1941, AC biasing models were sold, giving better sound quality. The Stille SEPMAG transport was one of the first SEPMAG systems. 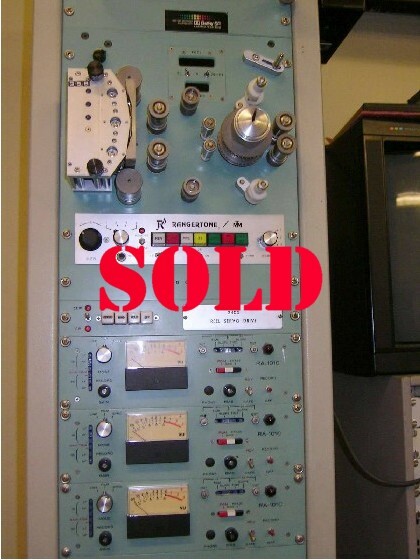 Some of the older sound followers' interlock speeds were too slow to keep up with the high speed shuttle speeds of modern telecines; therefore, some 240 Hz bi-phase buffers were made to help solve this problem. The major makers of sound followers are M.T.E. 's Magna Tech, RCA, and Sondor. Models can come in playback-only model or record-and-playback. Models can have the option of changing the number of tracks. Some are equipped with dual sets of sprockets that can use more than one size of magnetic film, 16mm or 35mm. Magna-Tech 835-B-6 600 Stepper motor transport. MTM – Multi-Track Magnetics Inc.
MTM D106/DCS-6 Stepper motor transport. FeRRIT Modern microprocessor transport control. RCA PM85 6 Channel 35mm Magnetic Film Recorder Stepper motor transport. Kinevox – Portable vacuum tube model, Burbank, California, Ca. Sound followers were also used in the 1960s strictly for audio recording & record album mastering, for the magnetic film format at the time had several advantages over standard magnetic recording tape. Magnetic film's extra thickness over tape made it less susceptible to "print-through", and its sprocket-driven nature made it less likely to suffer from tape flutter and other speed variations. Command Records in the 1960s released several albums that were recorded and mastered on 35mm magnetic film for several artists on the label, such as Enoch Light, Tony Mottola, and others. Sound followers are not used for most new film productions (the major exception being IMAX). Sound followers are still in use, as there are many separate magnetic films in film vaults. 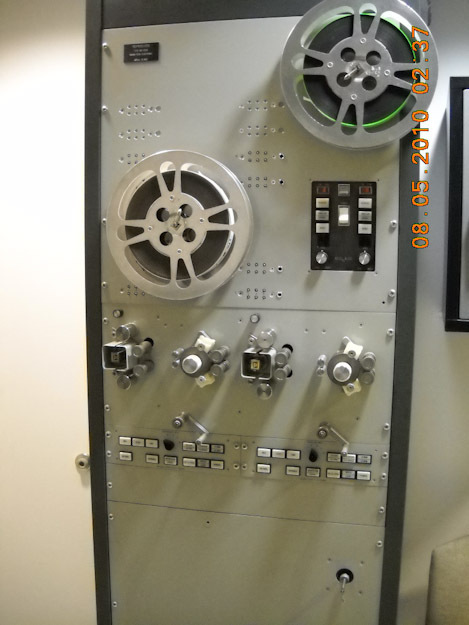 Reel to reel tape, then later hard disk drive and solid-state drive recording system replaced sound followers. ^ Georgia State University, How record heads work. ^ soundonsound.com A Practical Guide To Working With Pictures, Part 3,Tips & Tricks, Published August 2000. ^ n70mm.com, Todd-AO studios, use of room full of Magnatech units in post production. ^ The Editors Guild Magazine, "Math of Movies", Vol. 24, No. 1 – January/February 2003. ^ Sound recording, the life story of a technology, by David L. Morton, Jr.
^ a b Stan Ginsel, Video Producer Classic Movie Making – What’s a Dubber and Mag Stock? ^ The Editors Guild Magazine Vol. 25, No.1 page 126- January/February 2004, by Gregg Rudloff, Film Mixing. ^ National Association of Broadcasters Engineering Handbook, by Graham A. Jones, Edmund A. Williams, David H. Layer, Thomas G. Osenkowsky, pages 456-459. ^ youtube.com Magna Tech 10036-3 Film Sound Follower Recorder Player. ^ Magna Tech 10036-3 Film Sound Follower Recorder Player Archived 2012-03-23 at the Wayback Machine. ^ *College of Communication – The University of Texas at Austin, How to use a Magnatech. TV and Video Engineering, by A.M. Dhake.